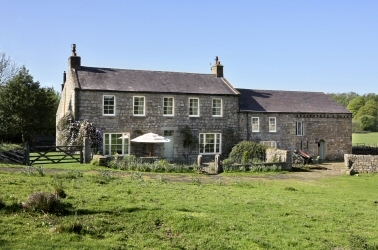 Nestled within a 90-acre site in a beautiful part of the South Tyne valley, these five luxury self catering holiday cottages near Haltwhistle, midway between Carlisle and Hexham on the southern fringe of Northumberland National Park, have been recently developed from a cluster of farm barns. Finished to a superior standard, with tasteful furnishings and oak flooring, they are well equipped with oil-fired central heating and many modern appliances appropriate for contemporary living. Outside space is not in short supply here, as our guests are welcome to explore all of the 100-acre Lambley Country Estate. All cottages enjoy the use of a central courtyard, complete with outdoor tables and chairs and a barbecue area. From the cottages, there are spectacular views along the salmon-rich River South Tyne and down the valley towards Lambley Viaduct. Kingfisher Cottage has a five-person hot tub and Shalom Cottage will have a six-person hot tub from early February 2019. 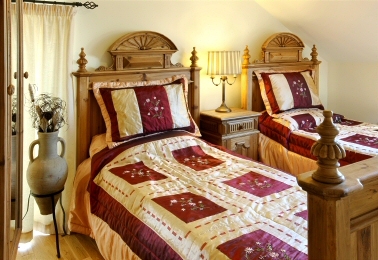 The holiday cottages can be booked individually or collectively to accommodate family reunions or large groups. All cottages are all of a comparable standard, each having been awarded 4 Stars by English Tourism Council. This wonderful self-catering holiday cottage offers the benefit of superb disabled access wet-room facilities, suitable for wheelchair users, and is perfectly suited for the larger family group. Open-plan lounge / dining room / kitchen with colour television, DVD player, and dining table and chairs for eight. Kitchen area with electric cooker, microwave, fridge, freezer, dishwasher and washer / dryer. Bedroom 4 : twin bedroom with wheelchair-friendly en-suite shower room with wc and basin. Bedroom 1 : king-size bedroom with four-poster and en-suite shower with wc and basin. Bedroom 2 : king-size double bedroom with en-suite shower, wc and basin. Bedroom 3 : twin bedroom. Bathroom : shower over bath, wc and basin. The Coach House is presently undergoing a refurbishment to convert it to a six-bedroom holiday cottage sleeping 12,. The improvements will include a wheelchair-friendly ground floor bedroom with an en-suite shower room, and an outdoor hot tub. It is due for completion by the end of March 2016. 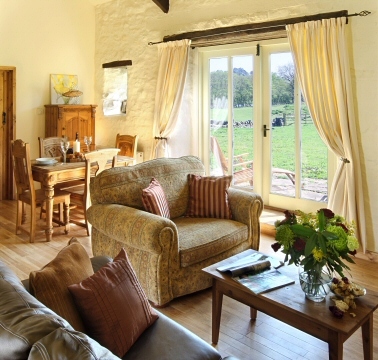 The Coach House offers superior self catering holiday cottage accommodation for twelve, making it a perfect choice for an expanded family or small group. Spacious open-plan lounge /dining room / kitchen with colour television, DVD player, and dining table and chairs for twelve. French doors open into the courtyard and provide views of the river. Two twin bedrooms, each with an en-suite shower room with wc and basin. 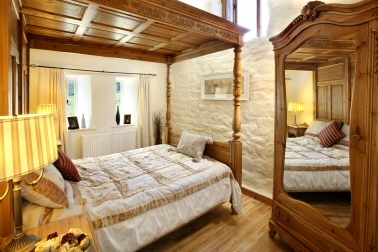 The larger twin bedroom and shower room is wheelchair-friendly and has French doors leading out into the barbecue area. Bedroom 1 : double with en-suite shower room with wc and basin. Bedroom 2 : twin bedroom with en-suite bathroom with shower over, wc and basin. Bedroom 3 : twin bedroom with en-suite bathroom with shower over, wc and basin. Bedroom 4 : double bedroom adjacent family bathroom. Family Bathroom : shower over bath, wc and basin. Barbecue area with private hot tub. 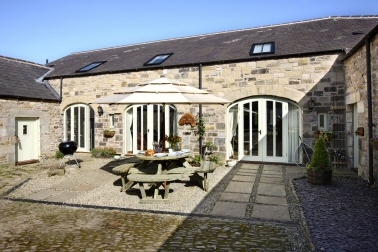 Sleeping five, this luxury self catering holiday cottage is ideal for a family with three children. Lounge / dining room with colour television, DVD player and single French door leading to the rear. Kitchen with electric cooker, microwave, fridge, freezer and washer / dryer. Bedroom 1 : twin beds. Bedroom 2 : single bed. Bedroom 3 : king-size bed. Six-person hot tub from early February 2019. Like The Pigeonaire, this luxury self catering holiday cottage is well suited for either a family of four or two couples. Spacious open-plan lounge /dining room / kitchen (33 ft) with colour television, DVD player, and dining table and chairs for four. Kitchen area with electric cooker, dishwasher, microwave, fridge, freezer and washer / dryer. Bedroom 1 : double bed with en-suite comprising shower, wc and hand-basin. Bedroom 2 : twin beds. This is an ideal choice of self catering accommodation for a couple or a couple with a child, with the bonus of a romantic four-poster. 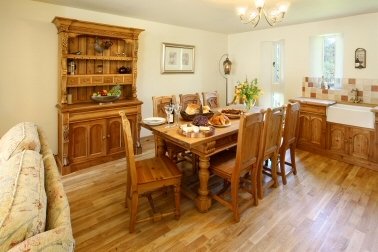 With the accommodation all on one level, this cottage is popular with elderly guests. Open-plan lounge /dining room / kitchen with colour television, DVD player, and dining table and chairs for three. Kitchen area with electric cooker, microwave, fridge, freezer, washer / dryer and French doors leading to the rear. Bedroom 1 : king-size four-poster bed. Further details can be found in our information section. You can access prices and availability for this property on-line and, if the dates you require are available, you can book on-line instantly.